Hijacking the host cell by virus often lead to an antiviral response. Apoptosis, the controlled process of cell death, is one such response. Apoptosis limits the time and the cellular machinery available for virus replication. Thus, viruses from diverse families have evolved mechanisms to evade cell death and prolong cell viability. Alternatively, others viruses promote apoptosis because they benefits from cell death. 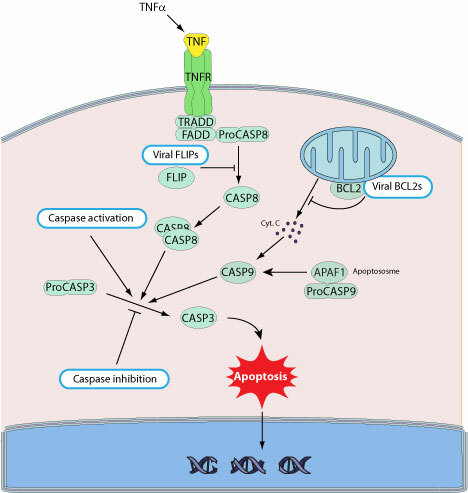 Caspases are central actors of apoptosis since they catalyze key steps by cleaving several effectors of the pathway. Many viruses interact and modulate capsases activity, either positively or negatively.